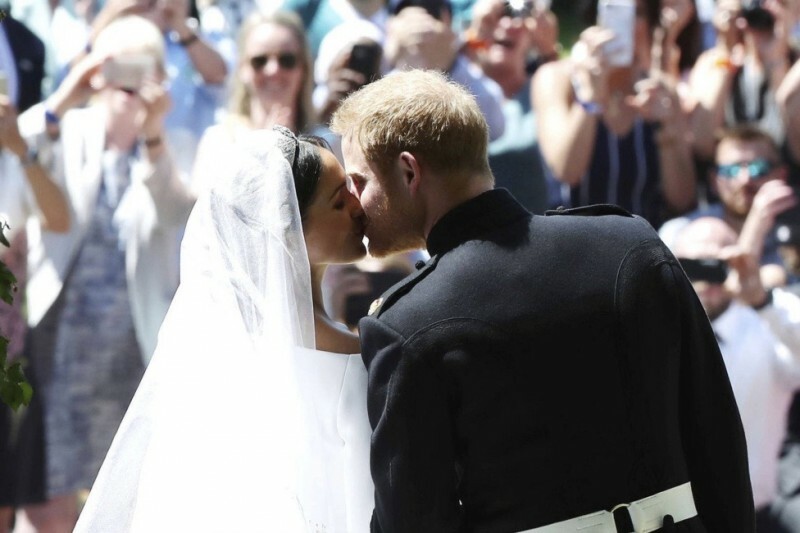 Meghan Markle and Prince Harry's kissed on the steps of St George's Chapel after their wedding in front of millions of people watching across the world. 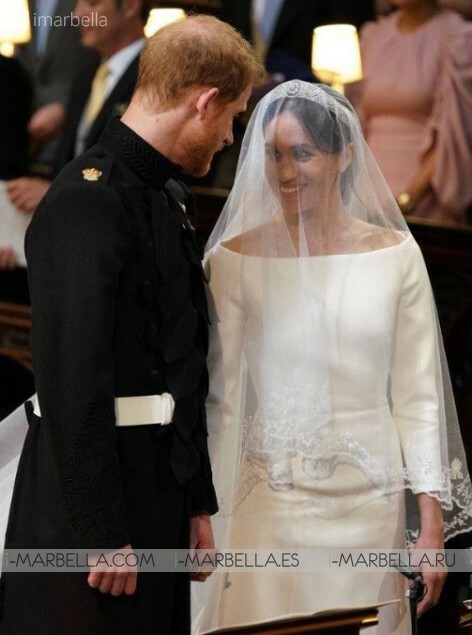 Ms. Markle and Prince Harry were married during an hour-long ceremony in the chapel that began at midday on Saturday, May 19th. 2018. Prince Harry and Meghan Markle have been declared husband and wife, following a ceremony at Windsor Castle. The couple has exchanged vows and rings before the Queen and 600 guests at St George's Chapel. Probably one of the most anticipated weddings of the year: Prince Harry and Meghan Markle have tied the knot today Saturday, May 19th, 2018 at St. George's Chapel at Windsor Castle. Meghan Markle and Prince Harry's wedding ceremony is today underway as millions of people across the world watch the coverage. 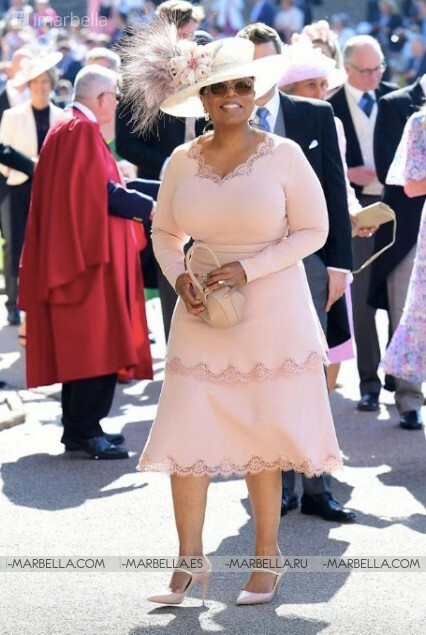 Celebrity guests including David and Victoria Beckham, Elton John, James Blunt, George and Amal Clooney, Pippa Middleton, Serena Williams, James Corden, Idris Elba, Sabrina Dhowre and US chat show host Oprah Winfrey began to arrive to take their seats in St George's Chapel, Windsor, from 9.30am. The day started with Ms. Markle leaving the Cliveden House Hotel, near Windsor Castle, at about 11.20am with her mother Doria Ragland. Prince Harry arrived at Windsor Castle with his brother Prince William about 15 minutes later. 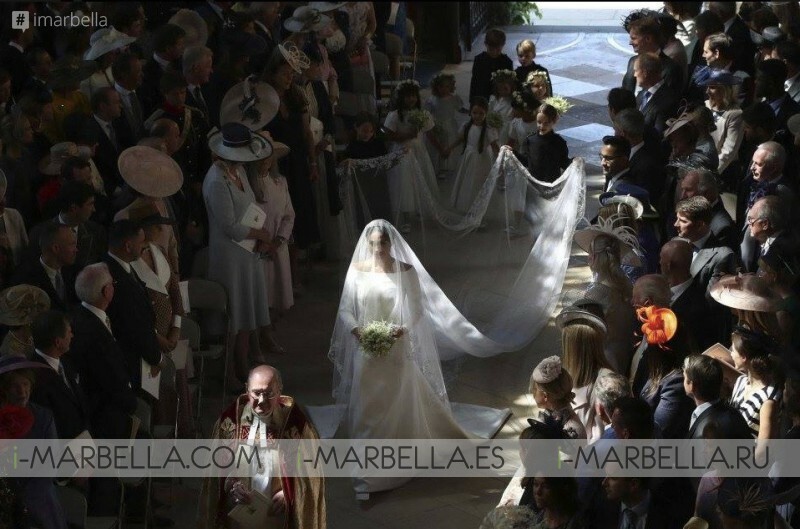 Ms. Markle's white wedding dress - with a white veil and boat neck - was created by British designer Clare Waight Keller, the first female Artistic Director at French fashion house Givenchy. Prince Harry and his best man the Duke of Cambridge are both wearing the frock coat uniform of the Blues and Royals. 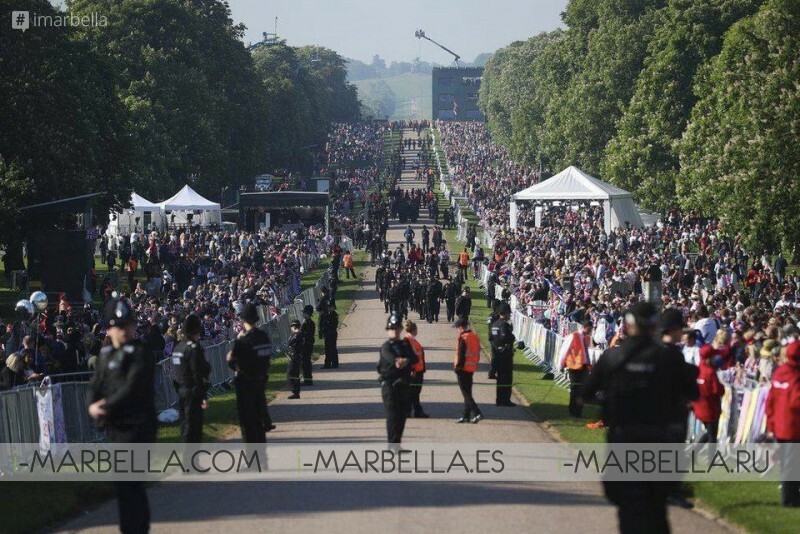 Another 2,640 members of the public were being welcomed into the grounds of Windsor Castle to watch events unfold while thousands of well-wishers lined the streets. Some have been camped out near the castle walls for days, while others arrived as early as 4 am to secure a good spot. They cheered and screamed as the newlyweds passed by. 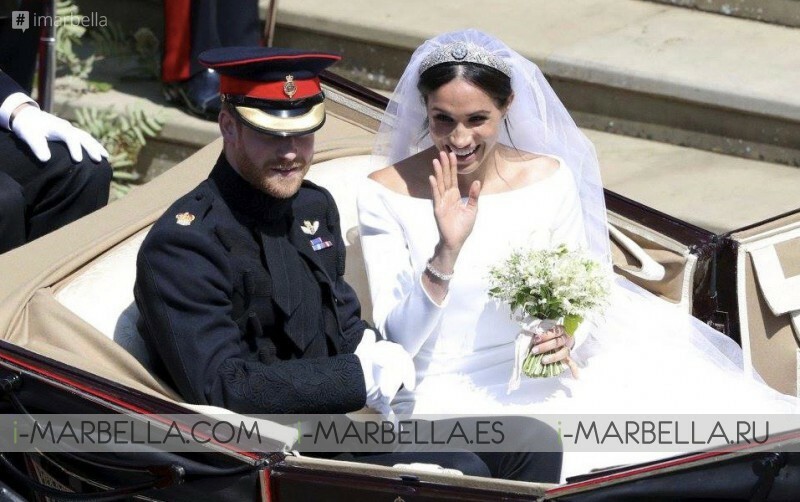 Meghan Markle's mother Doria Ragland was the first front-row guest to arrive at St. George's Chapel for her daughter's wedding, followed quickly by a car carrying Prince Harry's father Prince Charles and wife Camilla Parker Bowles. Prince Harry showed up for his wedding to Meghan Markle, stepping out of a black van in front of St. George's Chapel at Windsor Castle with his trademark (of late) beard intact. 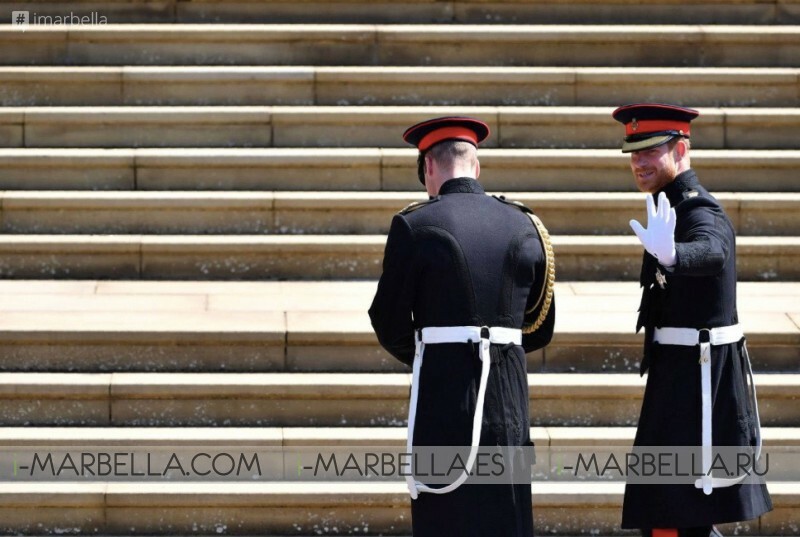 Prince Harry has defied centuries of tradition by keeping his beard while also wearing his military outfit; the rebel of the family. A vintage limousine pulled away from the Cliveden House hotel in London carrying Meghan Markle and her mother Doria Ragland to Windsor Castle for the American actress' wedding to Prince Harry. Other members of the royal family were seen walking into St. George's Chapel moments earlier, including Princesses Beatrice and Eugenie, Harry's cousins, and Princess Royal Anne, Queen Elizabeth's daughter. Leading the charge of "commoners" arriving to witness the royal wedding on Saturday morning was British actor Idris Abla, followed by U.S. media mogul Oprah Winfrey. Followed by one of the best-known names from the world of Hollywood royalty; George and Amal Clooney arrived and waved to fans as they approached the chapel. David and Victoria Beckham were close behind them. David Beckham, one of Britain's best-named soccer stars, and his wife, a former member of the Spice Girls, have long been friends with Prince Harry. These are some of the stars who were invited to the royal wedding among the 600 invited guests alongside senior members of the Royal family. Another 2,640 members of the public have been chosen to watch the ceremony from the grounds of Windsor Castle. The invitations were made by Barnard and Westwood, who has been making them for the British Royal Family since 1985, following "many years of royal tradition" ... and the golden detail is found on the insignia of the three feathers of the Prince of Wales. They also have American black ink in tribute to the Meghan nationality. The one in charge of printing the invitations, by hand, is Lottie Small who recently completed her apprenticeship, printed all of the invitations in a process known as dying to stamp, on a machine from the 1930s that she affectionately nicknamed Maude. The ceremony started with Archbishop of Canterbury Justin Welby presided over the ceremony. "We must discover the power of love, the redemptive power of love. "And when we do that, we will be able to make of this old world a new world. Love is the only way." "There's power in love. Don't underestimate it. Don't even over-sentimentalize. There is power, power in love." 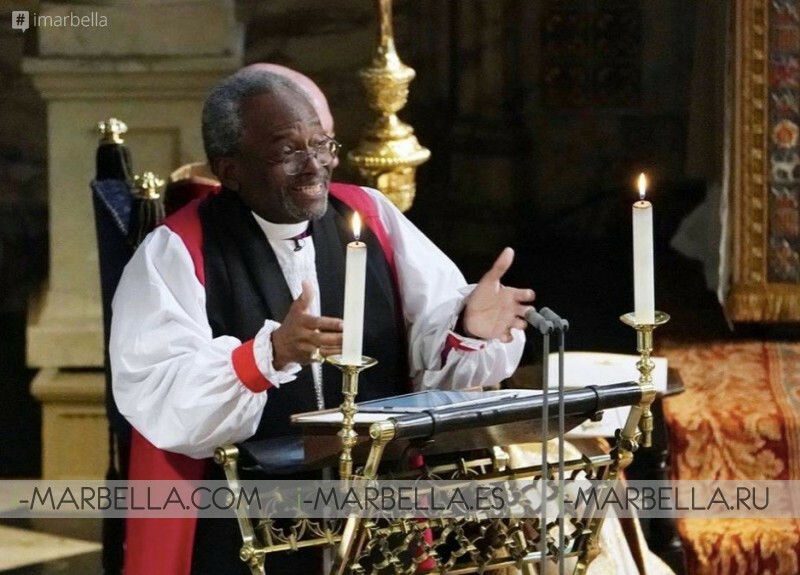 Bishop Curry addressed the audience as "brothers and sisters". After his reading, Karen Gibson and the Kingdom Choir gave a rendition of the pop classic "Stand by Me." 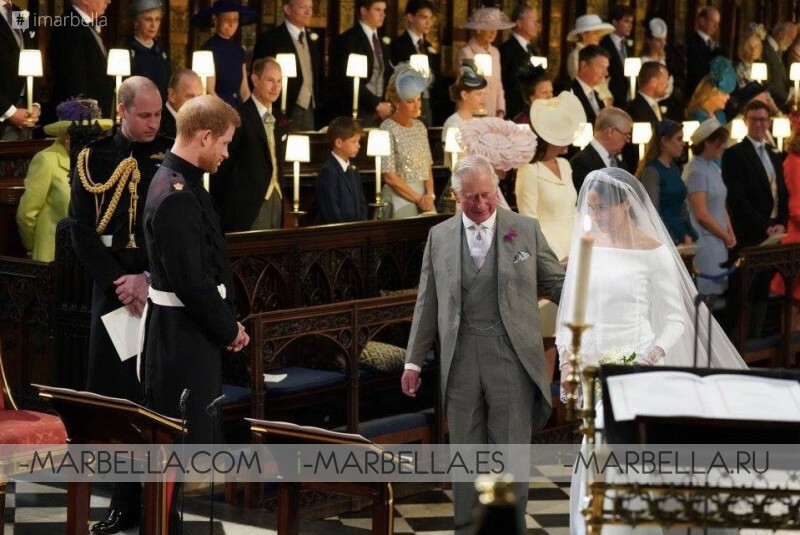 Welby then had Prince Harry and Meghan Markle to exchange their marriage vows, followed by the exchange of rings. Meghan's ring is made of extremely rare Welsh gold, in line with long-standing royal tradition. Harry's is platinum. Following then,"I, therefore, proclaim that they are husband and wife," came Welby's declaration following the exchange of rings. In the end, a cello performance by 19-year-old Briton, Sheku Kanneh-Mason, the entire chapel belted out God Save the Queen, as her majesty looked on with her trademark stoicism. Just Married! The famous kiss took place at the exit of the chapel of St. George in which people believe that Meghan has asked Harry "Do you give me a kiss?" to which he has answered bluntly "Yeah". The couple was declared husband and wife at shortly before 12.45pm, but the ceremony omitted the traditional moment of "giving away". Then the Dukes made a short tour around Windsor streets to greet the greet the people who had waited outside celebrating their wedding. The Royal Borough of Windsor and Maidenhead has said that more than 100,000 people were estimated to have lined the route of Prince Harry and Meghan Markle's wedding procession route in Windsor. Once the “public” element of the wedding was concluded. The couple then proceeded to the lunchtime in St George’s Hall at Windsor Castle. There will also be a smaller evening reception for around 600 guests drawn from the wedding service congregation. Prince Harry and Meghan Markle will be the 16th royal couple to tie the knot at the historic chapel since 1863. Queen Elizabeth II bestowed new royal titles early Saturday on her grandson Prince Harry and his bride-soon-to-be Meghan Markle. The couple will henceforth be known as the Duke and Duchess of Sussex. Markle will become the first ever Duchess of Sussex. The title of Duke of Sussex was vacant and had been regarded as the most likely choice for Prince Harry.